Increased awareness of issues of accountability and transparency in Church administration. Increased participation of laity in the governance of the Church. Pioneers in creating independent educational/news websites: Orthodox News (orthodoxnews.org) and the OCL website (ocl.org) viewed by hundreds of thousands of interested parties worldwide. Hosted 54 Educational Forums throughout the United States. Supported OCF and other charitable and educational endeavors. Provided scholarships to students attending OCF Winter Break Programs. Publication in 1994: Project for Orthodox Renewal which outlines the scope of the OCL Mission. Collaborated with St. Vladimir’s Press to re-publish the Alexander Bogolepov book Toward an American Orthodox Church. Established the OCL Archive at DePaul University. Stimulated discussion throughout all jurisdictions in America about the relationship and synergy of clergy, laity and hierarchy working together to provide good order in the Church. Remained the catalyst for discussion of Orthodox Christian jurisdictional Unity in North America. Two outstanding programming examples of this effort include: 22nd – The Road to Unity – From Vision to Action, Antiochian Village Ligonier, PA; and the publication proceedings of 20th Anniversary Meeting – Orthodox Christianity at the Crossroad: A Great Council of the Church – When and Why. Organized 24 s in various American cities discussing issues of concern to Orthodox Christians that relate to jurisdictional unity. Took action to maintain the autonomy of the various Orthodox jurisdictions in the United States. Met directly with the following hierarchs to discuss Orthodox Christian jurisdictional unity: Patriarchs Bartholomew (1993), Ignatius IV (1999); Metropolitans Theodosius (1999), Philip (1999-2005-2006), Herman (2005); and Archbishops Iakovos (1989, 1992) , Spyridon (1996), Demetrios (2000, 2010). Published “The Forum” Newsletter and Updates to keep members and friends informed about issues. Served as a catalyst to link Pan-Orthodox Ministries and Orthodox Websites. Educated the faithful to appreciate and celebrate the legacy of the Meeting of Conference of Orthodox Bishops in Ligonier, PA (1994). They set the example of what a true synod of bishops for North America can accomplish. Educated the faithful to appreciate and celebrate the 20th Anniversary (1987-2007) of the acceptance of the Evangelical Christians in the Orthodox Christian Church through the Antiochian Archdiocese. They lead the way for Orthodox Christian Evangelism, Missions and Outreach. Contined support for Project Mexico and St. Innocent Orphanage, Chula Vista, CA. Donated $20,000 to be used for organizational expenses of convening the First Assembly of Bishops held in NYC (May 2010). Educated the faithful to appreciate and celebrate the history of lay movements of the 1950’s and 1960’s, culminating in the creation of the Council of Eastern Orthodox Youth Leaders of the Americas (CEOYLA) and the 1963 Festival, Pittsburgh, PA. Exhibited at National Assemblies of various Orthodox jurisdictions. Chicago January 14, 1989 at the historic church of St George in Chicago…guests Rev. Christos Vagias and Rev George Scoulas. Presiding Officer President James A. Koulogeorge, founding president of OCL. By laws ratified, The Forum Publication established. This was an organizational meeting. Meeting June 5, 1989 Rye, New York with Archbishop Iakovos and Fr and Presbytera Baglaneas. Rye Town Hilton Hotel Nov 10-11, 1989. A Conversation with Archbishop Iakovos. November 9-11, 1990 Chicago, Illinois Theme “Together We Care” at the Inn at University Village and Saint Basil Greek Orthodox Church. Featured speakers Rev. Leonid Kishkovsky, Hon Paul Tsongas, Rev. Dr. Dimitrios Constantelos. October 25-27, 1991 Baltimore, Maryland: Workshop on topics included in Project for Orthodox Renewal: Administration and Accountability; Faith Language and Culture; Mission and Outreach; Orthodox Unity; Selection of the Hierarchy; Spiritual Renewal and Women’s Role in the Church. Keynote Speaker was Anthony Ugolnik. His topic was “Orthodoxy: A New World Vision.” Dr. Daniel Shahas spoke on the “Theological Foundation of the Role of the Laity in the Church.” Reception hosted at the Walter Gallery. Senator Sarbanes and Rep Helen Delich Bentley 2nd Congressional District Maryland attended. “Orthodoxy: Rediscovery and Renewal” Frontenac Grand Hotel, St. Louis Missouri, October 23-24, 1992 emphasis on Orthodox Unity and Orthodox Challenges. Speakers included Fr. Eusebius Stephanou, Th.D. on Proclaiming the Truth of Orthodox Renewal, Fr. Steven Vlahos on How Should the Church Address Interfaith Marriage? and Dr. Paul Meyendorff on Liturgy: Work and the Laity. Three workshops were conducted including Fr. William Gaines Orthodoxy and Young Adults, Pauline Sarantopoulos Orthodox Religious Education and Matushka Ellen Gvosdev on Women in the Church. October 29-31, 1993 Park Central Hotel, New York, Theme “A Call to Unity: One Christ, One People,” Fr. Thomas Hopko, Dr. Thomas Klocek, Dr. Andrew Kopan, and Dr. Alice Scourby were presenters. Oct 28, 29, 30, 1994 Skokie, Illinois “Embracing our Spiritual Identity” Workshops on the topics of the OCL Project for Orthodox Renewal. Keynote speaker was Demetria Velisarios Jacquet. Others included Fr. James Doyle, Fr. William Caldaroni, Fr. Joel McEachen and Fr Scoulis, Sts Peter and Paul Glenview, IL. November 17-19, 1995 Tremont Plaza Hotel Baltimore, Maryland “Orthodox Unity in the Americas.” Keynote speaker was Bishop Nicholas of Amissos on “Unity the Gift from God.” Fr. John Garvy of St Nicholas Church in Jamaica Estates moderated the forum: “What Unites Us, What Divides Us?” Panelists included Dr. Efthalia Makris Walsh, Despina D. Prassas and Nicholas Balamaci. Bishop Nikiphoros of Constantine also spoke on the conditions of the Church in the Holy Land. Afternoon session “Orthodoxy in Action” included Fr. Steven Vlahos, Fr Leon Pachis, Alexander Rondos and Fr. Milton Gianulis. October 11-13 1996 Sarasota, Florida “Transition, Renewal: One Faith, One Church.” Keynote Speaker was His Grace Bishop Iacovos of Catania, administrator of the Diocese of Atlanta. Title of his address was “On the Historical Jesus.” Other speakers included: Frank Schaeffer, “Renewing Orthodoxy: Rediscovering the Foundations of our Orthodox Faith,” Dr. Helen Theodoropoulos spoke on the life of St Symeon the New Theologian, Dr Nicholas Gvosdev on The Phanar Project, Sophia Stefanadis eloquently spoke on “Reaching our Young People.” Dr James Oliver vice president for Institutional and Program Planning at St Petersburg Junior College conducted an administrative workshop. November 14-16, 1997- The Harvard Club and The Maliotis Cultural Center at Hellenic College/Holy Cross School of Theology Boston, MA, Theme “The American Church and the Ecumenical Patriarchate,” Charles T. Lelon, John Collis, Dr. James Counelis, Rev Theodore Stylianopoulos, Dr. Ariseidies Papadakis, Dr. Valerie Karras and George Matsoukas were presenters. Discussions compiled in book form with above title: Light & Life 1998. October 9-11, 1998 The Jonathan Club, Los Angeles, CA, Theme: “Orthodoxy in the Next Millennium and the Role of the Orthodox Christian Laity.” Stephen P. Angelides, George D. Aravosis, George D. Coupounas, Dr. Peter Haikalis, John T. John, Rev. Michel E. Najim, Rev. Steven J. Vlahos, Dr. Verna Harrison. October 13, 14, 15, 2000 Doubletree Hotel at Lincoln Center, Dallas, Texas “Individual Responsibility in the Church,” Speakers on the topic included: Dr. Nikolas K. Gvosdev, Dr. Valerie A. Karras, John Sallas, His Eminence Archbishop Nathaniel, Romanian Orthodox Episcopate of America, Rev. Dn. Robert Schott, and Greta Larson. October 20-21, 2001, Renaissance Hotel Oak Brook, Illinois Theme: “Orthodox Christian Diversity …and the Unity We Need.” Peter Marudas, Dr. Elizabeth Prodromou, Dr. John Erickson, His Eminence Archbishop Nathaniel of Detroit, Primate Romanian Orthodox Episcopate of America all contributed to the topic. November 9, 2002 Westin Hotel, Detroit Michigan and St Andrew House Center for Orthodox Christian Studies, Theme: “Returning Home: Bringing or Youth Back to Orthodoxy.” Ann Salvador, students George Gallos and Larissa Galan, Archpriest Paul Jannakos, Natalie M. Kapeluck, His Eminence Archbishop Nathaniel, Romanian Orthodox Episcopate of America. Cleveland Marriott Downtown at Key Center, Cleveland, Ohio November 1, 2003: “The Orthodox Christian Ministries Networking Conference.” Presenters included: Very Rev. Anthony Scott, Executive Director of Stewardship Advocates, Gregory Yova founder and director of Project Mexico, Very Rev. Leon A Pachis, Director of Development Eastern Orthodox Foundation of Steel Valley-Senior Care and Healing, Renee Croitoru, Executive Director of Treehouse, Very Rev. Thomas Hopko, Very Rev. Peter Gillquist, Director of Missions and Evangelism, Antiochian Orthodox Christian Archdiocese, Paula Kappos, Executive Director ZOE for Life, Ann Salvator, Outreach Program Coordinator at St. Constantine and Helen Church, Cleveland. Eric Namee, President Virginia H Farah Foundation and Brian Gerich philanthropist and Rev. Scott discussed the need for the development of private foundations to support Orthodox missions and other Orthodox Christian needs. Church of St John of Damascus, Dedham MA October 8, 2005: “How to Do Pan-Orthodox Ministry Successfully Orthodox Christians United: Building Up the Body of Christ.” Keynote speakers included Very Rev. Gordon Thomas Walker, D. Min Department of Mission and Evangelism Antiochian Archdiocese, New Church Development and Dr. Robert Haddad, Sophia Smith Professor of History and Professor of Religion Emeritus, Smith College. The work of the Council of Eastern Orthodox Churches of Central Massachusetts was discussed by Deborah Sedares and the St. Nina Quarterly: Publication of Women’s Orthodox Ministries and Education Quarterly was presented by Teva Regule. Very Rev. Peter Gillquist talked about Orthodox Christian Fellowship: Campus Ministry. The College of Notre Dame, Doyle Hall, Baltimore Maryland, November 4, 2006: “The Present State and Future of Orthodoxy in North America.” Keynote Speaker was Archbishop Lazar, retired Archbishop (OCA) of Ottawa, Canada and Abbot of the All American Saints Monastery, British Columbia, Canada. He is a hesychastic theologian whose writings clearly reflect both the spirit and approach of St. Gregory Palamas and St. Symeon the New Theologian. He is a founder of the Institute for Canadian Orthodox Studies and the Nemanjic Institute for Serbo-Byzantine Studies. He is an acclaimed author of numerous books, monograph and articles. Other speakers included Professor and Journalist Terry Mattingly who spoke on the topic of So What Do the Converts Want, Anyway? Andrew Natsios, diplomat and professor, spoke on Working with the Orthodox Church Around the World in humanitarian efforts to serve the least of God’ children. Peter Marudas, journalist, political activist and commentator, spoke on The Ecumenical Patriarchate and Orthodox Unity in America. Subdeacon Robert Miclean presented his experiences on creating and implementing Campus Ministry programs in the Maryland area and the OCF outreach program at St. John’s College and the US Naval Academy. Father Peter Gillquist, discussed Crucial Steps to Orthodox Unity. Anniversary of OCL Celebration and Annual Program presented in Chicago, Illinois, November 2 and 3, 2007. Topic: “The “Upcoming’ Great and Holy Council: Who can Convene it? ; Why Have it; and Why Hasn’t it Happened?” Presenters included: Father John Erickson, Metropolitan Christopher, Father Alexander Abramov, Dr Vigen Guroian, Dr. Elizabeth H. Prodromou. Discussions compiled in book Orthodox Christianity at the Crossroad: A Great Council of the Church – When and Why. Introduction by Archbishop Nathaniel. October 31-November 1, 2009, Drexel University, Philadelphia, Pennsylvania. Theme: Bringing Together Area College Students of Learn about establishing Orthodox Christian Fellowship Programs on their Campuses. Presenters included Rutgers University OCF and area leadership. Fr. John Cassar, Mother of God Orthodox Church, Princeton, New Jersey, Keynote Speaker. October 29-31. Ligonier, Pennsylvania, The Road to Unity From Vision to Action. A Conversation about the future of the unified North American Church. His Beatitude Metropolitan Jonah Keynote Speaker. Presenters also included: Alexei Krindatch, Fr Justin Mathews, Sister Sarah Elizabeth Oftedel, Bryan Smith, Archbishop Nathaniel, Father Nicholas Apostola, Teva Regule, George Karcazes, Peter Petkas, Deacon John Zarras, Bishop Melchisedek, Father Hans Jacobse, George Pontikes, Bishop Thomas, Father Antonio Perdomo, Christopher Shadid, John Maddox, Father Peter-Michal Preble, Nicholas Katich, Peter Marudas. Father John Cassar was the moderator of the 9 panel discussions. October 15-16, 2010, Salt Lake City UT, Sts Peter and Paul AOC and Prophet Elias GOA Churches. Vision and Action Continued: Impressions of the Episcopal Assembly May 2010 by His Beatitude Jonah OCA and Archbishop Nathaniel Romanian Episcopate OCA. Canon Law for Today: How it applies to a unifed administrative Orthodox Church in the U.S. Fathers John Erickson and Alexander Lebedeff address the topic. October 7-8, 2011, Marriott Courtyard Hotel Pittsburg, PA, Parish Community Holy Assumption of St. Mary Church, Remembering the work and leadership of Council of Eastern Orthodox Youth Leaders of the Americas CEOYLA. Program Coordinator, Ronald Andrei Muresan, Past Chair, CEOYLA and VP of The Orthodox Brotherhood of Romanian Episcopate. Welcome by Igumen Patrick Carpenter rector. Panelists included His Eminence Archbishop Nathaniel, Primate of the Romanian Orthodox Episcopate of America; Video Reflection His Grace Bishop Basil Diocese of Mid-American Wichita, KS Antiochian Archdiocese; Jim Demetrion, Board Member Orthodox Christian Laity attendee 1963 CEYOLA Festival; Kweilin Nassar, a media professional and broadcaster who produced a special program on third CEOYLA Festival held at Mellon Arena. Michael G. Herzak, President and CEO Insurance Systems Group, Inc. and active member of OCA. Program also included audience participation. 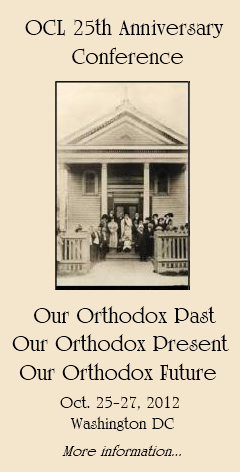 October 25-27, 2012, Washington, D.C. Theme: Our Orthodox Past- Our Orthodox Present- Our Orthodox Future. October 31-November 1, 2013, Moraga, CA. Theme: The Assembly of Bishops and the Future of Orthodoxy in America. October 23-26, 2014, St Vladimir’s Seminary, Crestwood, NY. Theme: Open Forum Discussion led by Alexei Krindatch on the Progress of Assembly of Canonical Bishops of U.S. and Central America. November 5-8, 2015, San Diego, CA. St John of Damascus Orthodox Church, Poway, CA. Theme: Orthodox Working Together. Update on the Assembly of Bishops: Archbishop Nathaniel, Archbishop Benjamin and George Matsoukas. Inter-Orthodox Cooperative Efforts: Ben De La Riva, Executive Director of Project Mexico/St Innocent Orphanage and Andrew Kartalis on cooperative efforts in Cleveland, OH Area in developing a model OCF Program. Board Members visited Project Mexico Site. From 1987- 2011 OCL has hosted 70 REGIONAL OPEN FORUMS throughout the United States as part of its educational outreach program. De Paul University, Chicago, Illinois – Department of Special Collections and Archives, Richardson Library houses the OCL Archives.